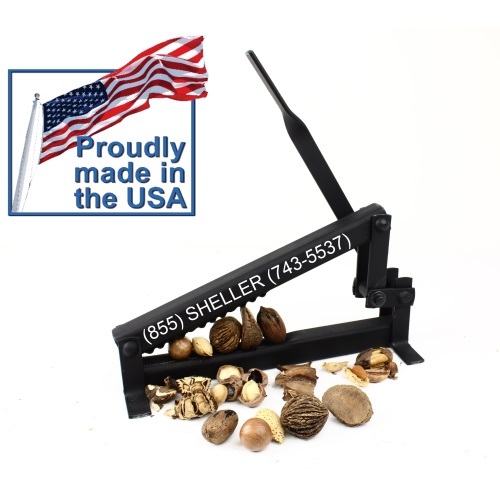 Get Crackin' Cracker - Black Walnut Cracker for Serious Nut Crackers! I sell a lot of nut crackers. My Kinetic Kracker (Electric Pecan Cracker) and Drill Cracker (for black walnuts and hard shell nuts) are leading nutcracker sellers on eBay. I ship them around the world Even so, sometimes there comes along something that makes me say, "Why didn't I think of that!" This black walnut cracker is one of those items. How many times have I used the diagonal pliers and nut picks to get out the tiniest and most aggravating pieces if nutmeat? GRRR! That's ended now because this simple nut cracker can re-crack those stubborn little pieces. we love this nut cracker. It is by far the best one we have ever bought. It handles our hickory nuts very easily. we would recommend it for anyone. I have 3 nutcrackers. This is the only one that cracks black walnuts, and does it easily. I wrap the cracker in a towel to collect all the pieces. Very sturdy. This nut cracker is very heavy duty and will do the job. The best part is the shells of the nuts don't shoot across the room. Great for black walnuts. I would recommend this to anyone who has many black walnuts they're grappling with. My 75 year old dad uses this to crack walnuts so almost anyone can use this cracker. I am absolutely DELIGHTED with this nutcracker! It is a joy to use and performs beyond my expectations. The nutmeats do not get crushed and most are large nearly complete pieces. It is very easy to use on English walnuts and requires a bit more pressure for those hard black walnuts. You can finesse the smaller pieces and still get a nice piece of nut. It is a BARGAIN at this price (and I am quite the penny-pincher).